If you wear monthly or weekly contact lenses, using contact lens solution is important in keeping them working their best. We stock a wide range of solutions that are ideal for caring for your contact lenses, meaning that they are always clean and comfortable for you to use. What are contact lens solutions and why are they important? Contact lens solutions are products designed to clean, disinfect and care for your monthly or weekly lenses. Typically, you would use them at the end of the day when you’re taking your contacts out for the night, cleaning and rinsing them first before storing them in a contact lens case filled with more solution. There are different types of solution for contact lenses, depending on how you like to use them and what type of lenses you wear. The most common kind of solution is multi-purpose solutions, used for soft contact lenses made from hydrogel or silicone hydrogel. As the name suggests, these are an all-in-one option that can be used to store, clean and re-wet monthly, weekly and daily lenses. 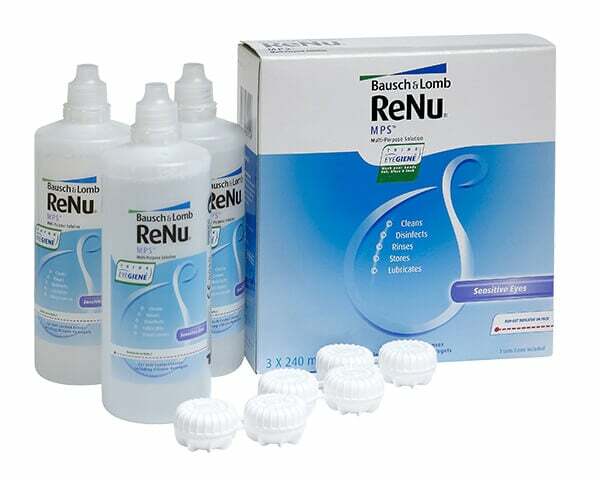 Contact lens cleaners and saline solutions are perfect for effectively removing any dirt or debris from your lens surface, ensuring clean lenses that feel fresh to wear. If they need a deeper clean, you may want to use a protein removal tablet instead of a solution, such as Ultrazyme Universal or Amiclair. Gas permeable solutions are made to clean, disinfect and store RGP or hard contact lenses. As they are made from a different material to soft contacts, they need a different type of solution. 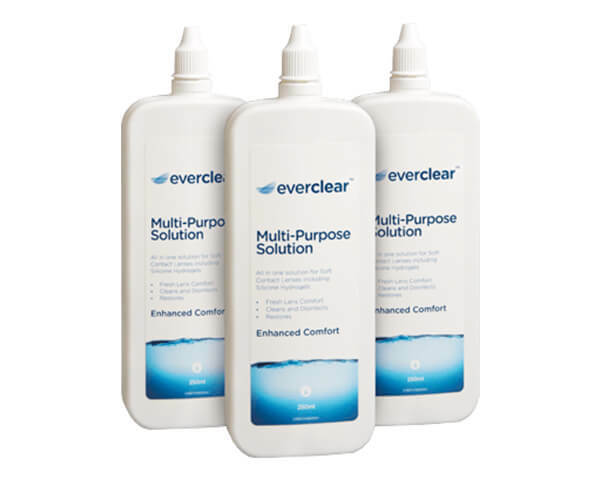 The good news is that products like Total Care and Boston Simplus are all-in-one options that are perfect for cleaning, storing and disinfecting rigid gas permeable lenses. If you’re heading off on a trip it might not be so convenient for you to take your solution with you, particularly with airport restrictions on liquids. In this case, you can pick up a travel or flight pack. These perfectly portable bottles are ideal for a trip away and fit easily into your hand luggage. What are the benefits of using contact lens solution? Contact solutions are essential if you wear monthly or weekly lenses. They’re the only way to guarantee that your lenses are hygienic to wear and that your eyes stay healthy and comfortable while you’re wearing them. Over the course of the day, it’s only normal that your lenses will accumulate dirt and debris and protein deposits may build up. Not only can this irritate your eyes, but it can also obscure your vision. Regularly cleaning your lenses is the only way to ensure perfectly clear eyesight, free from discomfort. Storing your lenses in solution guarantees that they stay sterile, correctly shaped and properly hydrated. The chemicals contained in solutions are specifically compatible with the material of your contact lenses to keep them in top condition and so water will not do as an alternative. Multi-purpose solution can even be good for daily contact lenses. Although they don’t need to be stored each night in solution, you can use it to clean or rewet them during the day should you experience any irritation or if any dirt builds-up. This multi-purpose solution, exclusive to Vision Direct, is a gentle and effective all-in-one solution that’s perfect for caring for soft contact lenses. Coming in a handy 3-pack, this offers excellent value for money and is shaped for convenient delivery that fits easily through the letterbox. Manufactured by optical pioneers Bausch & Lomb, this winning formula was the first multi-purpose solution ever used and remains popular to the present day. Available a useful 3-pack, these bottles are designed to fit easily through the letterbox, ensuring convenient delivery. 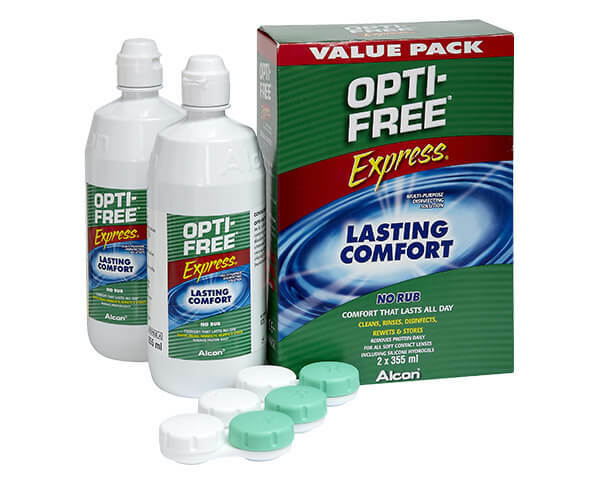 This multi-purpose solution comes in packs of two and is manufactured by leading contact lens manufacturer Alcon. It’s designed to care for your lenses overnight so that they feel exceptionally comfortable for the entirety of the next day. 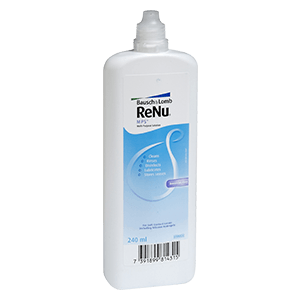 This hydrogen peroxide based solution simple and effective when it comes to cleaning and disinfecting your contact lenses. 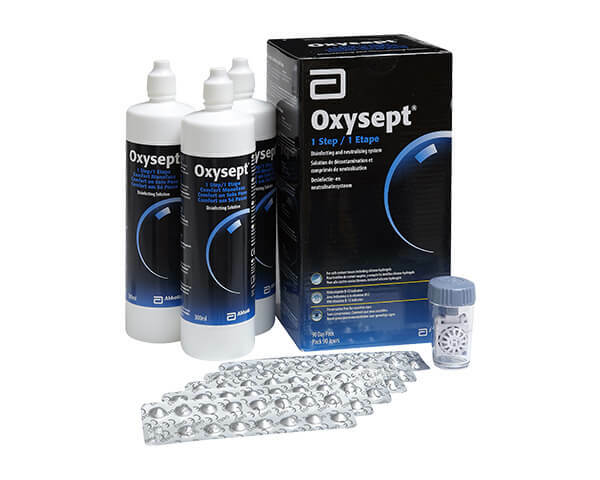 Combining solution and tablets, Oxyspet 1 Step is a thorough way of removing any impurities from soft lenses. 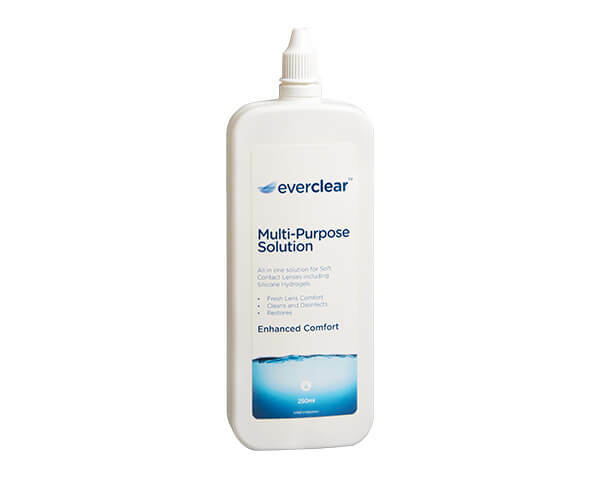 Everclear Flat Pack Multi-Purpose is exclusive to Vision Direct and destroys dirt, make-up or any other debris from the surface of your lenses with ease. This solution comes in a bottle that is perfect for easy delivery and holds 250ml of liquid.